Instructions: Overall Card size is 6 x 6". Cut white cardstock to 12 x 6". Score and fold at 6", then diecut card base with the plain eyelet accent shape. Choose your paper from the Young at Heart Paper Pad and cut 3 pieces. The largest cut at 5 7/8 x 5 7/8". The second paper cut to 5 9/16 x 5 9/16". Cut the smallest paper to 5 5/16 x 5 5/16". Using your distressing tool, distress the two smallest papers. On the smallest paper, tear in spots as desired. Adhere all three papers together before die cutting using the plain eyelet accent shape. Adhere onto your card base. Stamp the truck, and rock terrain in black ink onto white cardstock and die cut. Color the base of the truck with Sky Blue ink, blended with Forget Me Not ink. Use Vivid Chartreuse and Leaf Green on the foliage, Pink Peony on the tiny flowers. Color rocks, hub cap and bumper very lightly black ink. Using Carnation Red ink on white cardstock, ink only one word at a time from the Happy Father's Day stamp, cleaning stamp after each word has been stamped. Then diecut each word individually using the arrow die, alternating the direction of the arrows. Die cut the plain strip from the Tickets and Tags die set as your post for the sign. Color all of the Father's Day sign pieces in Vivid Chartreuse and Leaf Green ink. Shape all pieces as desired using the Deluxe Flower shaping kit. Diecut 4 layers from white cardstock using both eyelet accent shape dies to create a frame. Color one piece with Buttercup ink along with a dauber, then adhere the rest together to create a thick dimensional frame. Use dauber to sponge Dries Clear glue onto yellow frame and sprinkle with glitter, allow to dry. Stamp inside sentiment on white cardstock using Plum ink and die cut with plain eyelet accents shape die, ink the edges with Butter Cup ink and very lightly add Sky Blue ink on the lettering of the sentiment. Adhere both the frame and the inside sentiment onto card. Stamp love sentiment in Plum ink and die cut using the rounded top tag die. Die cut 3 more tag shapes and adhere together. Ink the back side and front with Buttercup ink. Die cut 2 oval tags from the paper pad, one for the front and one for the back, then diecut an additional 2 from white cardstock and adhere together. Add Crystal Lacquer on the tag, allow to dry, then add it on the back of each tag, and allow to dry completely. 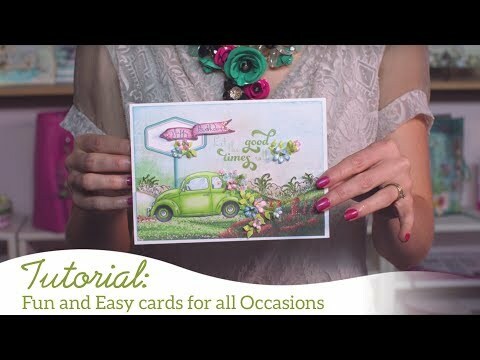 Adhere all pieces to card as shown and add glitter on card as desired. To complete, tie tags onto card base using brown twine.